For much of its history, Newfoundland and Labrador have been dependent on the fishery. Efforts to diversify the economy and create mining, forestry, manufacturing and agricultural industries have been undertaken, but with mixed results. In the second half of the twentieth century, when it was clear that the fishery could no longer be the province's mainstay, oil was seen as the economic saviour. But this industry would not come without cost. The Hibernia oil field relative to Newfoundland and St. John's. The location of the Hibernia oil field means that oil rigs operating in the area must be able to handle such threats as icebergs and severe storms. Map created by Mark Kirby, Map Room, Queen Elizabeth II Library, MUN, using ArcMap 9.3, November, 2010. © 2010. The search for oil reserves off Canada's eastern seaboard began in the 1960s, and was well underway by the 1970s. Wells were drilled in the waters all around the island and off the coast of Labrador, but exploration focused mainly on the Grand Banks. These efforts paid off in 1979 when oil was found in the Hibernia field. It was clear that this field could contain huge oil reserves. To secure financial backing and plan production facilities, oil companies needed to know exactly how big the field was. To do this, Mobil Oil (which held the oil leases for the area) drilled “delineation” wells to map the Hibernia field. This is the work the Ocean Ranger was doing in the winter of 1982. The Ocean Ranger was a self-propelled, semi-submersible offshore drilling rig, designed and built by ODECO (Offshore Drilling and Exploration Company) for use in offshore oil exploration. At 121 metres long, 80 metres wide, and 103 metres tall, it was the largest rig of its kind when it was launched in 1976. The normal crew complement was around 80-85, although it could carry up to 100. Most of the men would be involved in drilling operations. 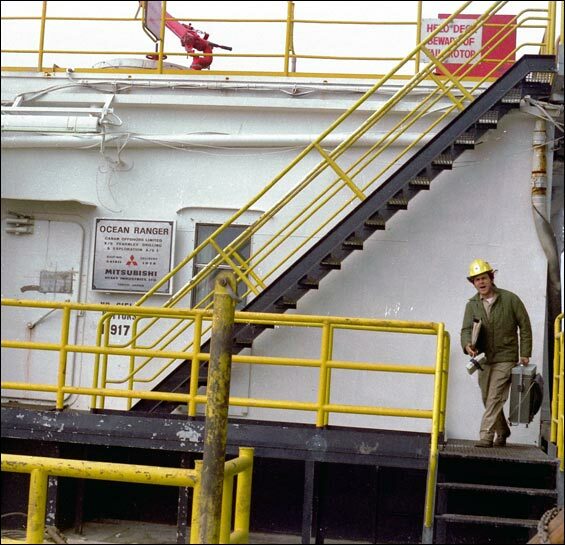 Unidentified rig worker on the deck of the Ocean Ranger in 1980. Photo by John Weston. © John Weston, 2012. The semi-submersible design is popular for rigs like the Ocean Ranger. Called Mobile Offshore Drilling Units (MODUs), these rigs float on large, ballasted pontoons that sit under the water. Through a series of pumps, switches and valves, these pontoons can be filled with water to adjust the rig's position in the sea. This allows the drilling deck, helicopter pad, and crew accommodations to be high above the water and out of reach of most wave action. In addition, because the pontoons are below the water rather than floating on top, a semi-submersible MODU is protected from the movements of waves and wind, and does not heave and roll as badly as a surface ship. This makes for a much more stable drilling platform. The Ocean Ranger had previously drilled off the coasts of Alaska, New Jersey, and Ireland. In November 1980 it moved to the Grand Banks to drill the Hibernia field. On Sunday, 14 February 1982, the Ocean Ranger was drilling at Hibernia well J-34. It had 84 people on board, including 56 Newfoundlanders. At 8:00 am the rig received a weather report stating that a strong winter storm, with winds of 90 knots and waves of up to 37 feet, was forecast to pass over its location later that day and during the night. The Ranger continued to drill until around 4:30 pm, when it “hung off” (disconnected its drill pipe and retracted it for safety) and prepared to ride out the storm. The storm was in full swing by 7:00 pm when two other rigs in the area, the SEDCO 706 and the Zapata Ugland, reported being hit by an unusually large wave, which did some slight damage to SEDCO 706. Shortly after, the two rigs and nearby support vessels began to overhear radio chatter from the Ocean Ranger that referred to broken glass and water, and to switches and valves that seemed to be operating by themselves. The Ranger confirmed to the other rigs just after 9:00 pm that a portlight, or window, had been broken in the ballast control room, but it had been cleaned up and didn't appear to be anything serious. A radio operator on shore received the regular weather report from Ocean Ranger's weather observer at 11:30 pm, and there was no indication of problems. Around 1:00 am on Monday morning, however, Mobil's senior manager on the Ocean Ranger contacted the shore to report that the rig was listing. Shortly afterwards, the Ranger called the supply vessel Seaforth Highlander, which was on standby for the rig in case of emergencies, and asked it to move in closer. By 1:10 am the Ocean Ranger was sending out Mayday calls. The final message received from the Ocean Ranger was at 1:30 am, when the radio operator advised that the crew were heading to lifeboat stations. This was clearly a major emergency. The two nearby rigs dispatched their standby vessels, but because of the storm's violence, it was very difficult for them to make headway. Searching for survivors proved to be even harder. The Seaforth Highlander spotted flares from a lifeboat at 2:21 am and headed towards it. The lifeboat was damaged but there were men aboard. The Seaforth Highlander was able to get a line attached to the lifeboat, and the first mate came within feet of grabbing one of the men. But the heavy seas snapped the line and capsized the lifeboat, and ultimately the Seaforth Highlander was unable to rescue a single men. The Ocean Ranger was still afloat at 2:45 am when the supply ship Boltentor came within visual range. She was listing heavily and waves were breaking over the deck. There was no sign of any people aboard and the lifeboats were gone. Shortly afterwards the ships in the area lost radar contact with the Ocean Ranger as it finally capsized and sank. Although the search and rescue efforts continued throughout the night and the following days, there were no survivors. Two empty life boats and several life rafts were found, along with debris such as life jackets and broken bits of foam. The lifeboat that the Seaforth Highlander had tried to rescue was later spotted by the supply ship Nordertor. The Nordertor's crew could see bodies inside, but they too were unable to recover it. The lifeboat floated away and was never found again. In the following days, ships in the area picked up 22 bodies. All of those recovered had died of drowning and hypothermia. The loss of the Ocean Ranger was not just a terrible tragedy, but also a wake-up call to the oil industry, the provincial and federal governments, and the people of Newfoundland and Labrador. The Ocean Ranger Families Foundation was formed to help the families of the men who had died. Chaired by Lorraine Michael (who in 2006 became leader of the provincial NDP), the foundation offered financial support and counseling, and attended the subsequent hearings and inquiries on the families' behalf. The foundation later became more involved in pushing for increased safety regulations in the offshore oil industry. 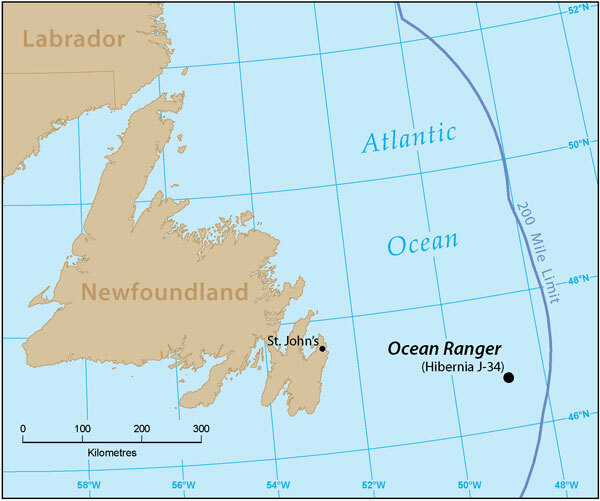 The Royal Commission on the Ocean Ranger Marine Disaster was set up on 17 March, 1982 under Chief Commissioner T. Alex Hickman of the Newfoundland Supreme Court. The commission was to investigate why the Ocean Ranger sank and why none of the crew survived, despite at least some of them evacuating successfully. Over the next two years, the commission interviewed witnesses, recovered vital parts such as the broken portlight and damaged ballast control panel from the wreckage, and undertook studies to understand why the Ocean Ranger sank. The Royal Commission found that the rig had several design flaws: the shattered portlight and chain lockers that were not water tight, for instance. The crew did not fully understand what to do in the case of an emergency involving the Ranger's ballast control system. The lifesaving equipment was judged inadequate, and the crew lacked training in its use. All of these factors played a role in the sinking and loss of life. The loss of the Ranger affected the design and safety features of future oil facilities such as the Hibernia platform, and led to much tougher regulations regarding safety equipment and training. Yet, as the loss of Cougar Flight 91 in March 2009 demonstrated, offshore oil is still a dangerous business. The Ocean Ranger Memorial, sculpted by artist A. Stewart Montgomerie, is located on the Confederation Building grounds in St. John's. Photo by Kimberley Dymond. Reproduced by permission of Kimberley Dymond. © 2010. Tragedy at sea is a common theme in Newfoundland and Labrador artwork, and the Ocean Ranger has been the subject of several artistic works. 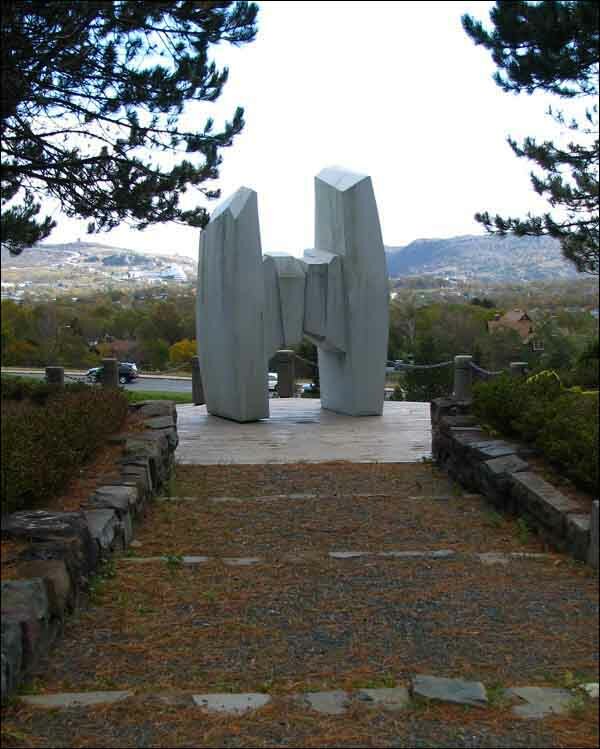 The Ocean Ranger Memorial, located on the grounds of Confederation Building in St. John's, was sculpted by artist A. Stewart Montgomerie. The late singer/songwriter Ron Hynes composed the song “Atlantic Blue” about the Ocean Ranger. Lisa Moore's 2009 novel February deals with the aftermath, and there have been collections of memories and stories published about the disaster. But Who Cares Now? by Douglas House, was published in 1987. Rig: An Oral History of the Ocean Ranger Disaster by Mike Heffernan, was published in 2009 and has been adapted into a stage play. Oil may promise to bring a degree of prosperity to Newfoundland and Labrador in the coming decades, but it is an industry that comes with a cost. For other related articles view the Disaster section of the Government and Politics Table of Contents.